The political situation in Washington DC delivered a nice boost to risk assets and high-beta currencies. The announcement that Congress reached a tentative deal on border security signaled the US will not see a second government shutdown. President Trump remained true to form noting he had concerns with deal, but emphasized he does not expect a shutdown, enough of a sign that markets believed he will not veto this agreement. Overall risk sentiment was badly hurt in December from the longest shutdown in US history, the trade war, and the Fed’s policy mistake. With the shutdown mostly behind us and the Fed pivot firmly in place, markets need only a trade deal to have the green light for the risk rally to continue. Spanish Prime Minister Pedro Sanchez appears poised to lose a key vote on his 2019 budget as expectations remain high he will fail to get the needed support from the 17 pro-independence votes from Catalan lawmakers. If he does lose the budget vote, we will likely see snap elections in April or May. Separatists leaders from Catalonia also began their lengthy trial for their push for independence in 2017. If convicted on rebellion, sedition, and misusing public funds, the leaders could face up to 25 years in jail. The trial is likely to hurt any chance of seeing the Nationalists vote alongside the Socialist party. The market reaction to Spanish yields might be limited with the budget vote, but populist narrative remains a growing theme for the European Parliament elections in May. Well under seven weeks (44 days) until the UK is expected to exit from the European Union, Prime Minister May continues to wind down the clock while Labour appears adamant in stopping her and the dangerous game of chicken. PM May has been unable to get any concessions from the EU and is seeking another two weeks before Parliament holds a meaningful vote on taking over Brexit negoitations. PM May is set on reopening the withdrawal agreement with the EU, but it appears the EU has no problem waiting until we get closer to the Brexit date. Time is running out for the UK to reach an agreement and expectations for an extension of Article 50 are growing. The UK needs to go through the motions of rejecting May’s current deal again in order to signal they need changes to the backstop, and if the EU does not play ball, we will see Article 50 extended. The stock market rally approached key resistance levels as high hopes grew for a trade deal and after US lawmakers potential ended worries of another government shutdown. The S&P 500 rose 1.3% on the strength of consumer discretionary, financials, and materials stocks. American lawmakers appear to have removed a key risk event by avoiding a second government shutdown and while the President is not completely happy with the deal, it is highly expected he is content enough with this agreement and can now try to move forward with the rest of his agenda he outlined with his State of the Union address. 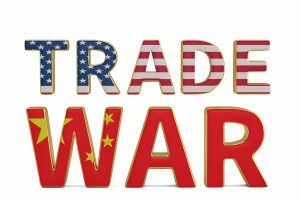 The positive talks on the trade front is the bigger story of the day and we are still a long way from see a framework agreement between the US and China. Today’s price action with risk assets reflect the optimism talks will continue to progress, but the key quote from the President was that he was open to letting the March 1st deadline for China tariffs slide. A confirmation of Trump/Xi meeting would be the next positive development to confirm positive progress in talks. Gold prices appear to remain stable despite Tuesday’s rally, a clear sign that slower global growth is likely to still to remain despite a positive outcome with US-China trade war. Europe remains weak, Brexit is likely to be a headache that will hurt growth for the continent and emerging markets may struggle to rebound sharply as the US is not likely to remain accommodative for the entire year. Crude prices benefitted from a weaker dollar and news that Saudi Arabia will deliver deeper production cuts. The problem for OPEC is that US production is likely to continue to grow and further cuts the Saudis will have less impact on the markets. Production declines due sanctions or a force majeure respectively from Venezuela and Libya have also helped support the recent rally, but news of both countries returning to normal may be the straw that breaks this recent rise in crude prices. OPEC may need to cut again if we see a return of WTI below $45 and Brent below $55, but it would be unlikely to occur before the next extraordinary meeting of OPEC, which is not until April 17th.